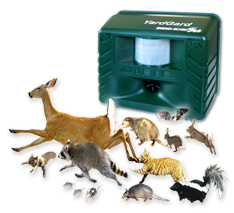 The Yard Gard Ultrasonic Repeller is ideal for animal control. Select the Animal Contol Setting and plug it in. The ultrasonic sound environment is intolerable to bats. 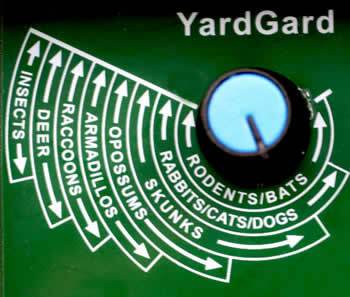 Animal are repelled away from the Yard Gard Ultrasonic Repeller because they cannot adapt to the constantly changing array of ultrasonic emitted by this device. The #1 pest repeller on the market. Guaranteed to work or your money back! -No chemicals or sprays. Just turn it on and let it work! Don't mess with chemicals or messy sprays. We've experienced great results with this unit. Laboratory tests have proven this yard protector is highly effective for pest control. This electronic yard protector uses adjustable, powerful ultrasonic sound waves to repel dogs, cats, deer, rabbits, raccoons, opossums, armadillos, skunks, bats, rodents and other creatures. The sound waves coming out of the unit create a very high pitch, high sound pressue environment that is incredibly uncomfortable and annoying to animals. The sound is inaudible to humans and can be tuned specifically for the type of animal you're trying to repel by adjusting the knob on the back of the unit. Set up is easy. Just plug the unit in or insert 4 "C" batteries (unit can only be run on motion sensing mode when running on batteries), point the unit so that it's coverage area is protecting the space you're trying to keep animals away from, set the knob to the approrpate animal or range of animals you're trying to repel and turn the unit on. The ultrasonic sound waves will immediately project out from the unit creating an invisible protection area where animals will have no desire to habitate. Humane and effective, ideal for yards, gardens, porches, buildings and greenhouses, for up to 4,000 square feet of coverage (oval pattern, 80 feet out from unit and 50 feet wide). Dual power-source capable (any standard 110 electrical plug or 4 "C" batteries). This unit is designed for outdoor use and has a waterproof casing. Try it for yourself. Discover the safer, easier way to handle your pest problems for good. And if you don't think it works, send it back. Your money will be cheerfully refunded. YardGard along with Other Units Have Effectively Solved Deer Problem! We recently bought four of your units. Until we used your equipment, we were plagued with deer. Now, it seems your units have stopped our problem. We use 3 Yard Gard units in an area of less than 4,000 st. ft. The sound of the units overlaps, and each unit goes off at a different time which has been an effective technique. Please fell free to use this letter as a reference.